$595. 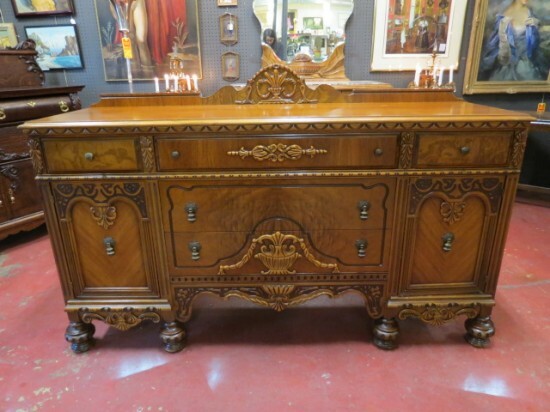 Vintage antique carved walnut Tudor revival credenza/buffet, c. 1930. Burled walnut drawers along with bookmatched walnut doors. Applied carvings to drawers and doors. Carved apron, carved backsplash. Original hardware. Round, bulbous feet. Lots of storage here! Perfect for your living room or dining room. Very good condition. 67in wide, 21in deep, 44in tall.